So the phone’s whole name should be called the Alcatel OneTouch Blaze Duo 890D – which is quite a feat to say in one breath. Features include a 420Mhz processor, 2.8” 320×240 resistive display, 2MP Camera with no flash and front facing, and that’s pretty much it aside from the standard WiFi, Bluetooth and GPS. Of course, the phone runs on two SIMs which would probably be the selling point to some buyers – as well as the introductory price tag of PHP 4,999. As far as budget Androids go, this and the Cherry Mobile Eclipse 2.2 are competing for the cheapest – and they’re both dual SIM Android 2.2 devices too. Plus, they both don’t seem to have any 3G antennas either. While we can’t really tell which of the two budget phones is better than the other, they’re both still quite underspecced for an Android. Still, if you’re in the market for it, this is one of your options. We’re not sure when this comes out, but since we’re attending an Alcatel launch this week, we’ll have that info soon. Until then, check out your local Alcatel retailers when you pass them by. Normal SRP is PHP 5,999.
baka makakuha po kayo ng comments from other users regarding usage of this phone and the troubles they encountered..
kung meron po, please post naman po or email me kung may time kayo. thank you ng one million plus!! great site for new tech inno! Sure! We’ll try to let you know. Also, we’re hoping to review more Alcatel devices soon so hopefully they’ll send over an 890d for us to check out. 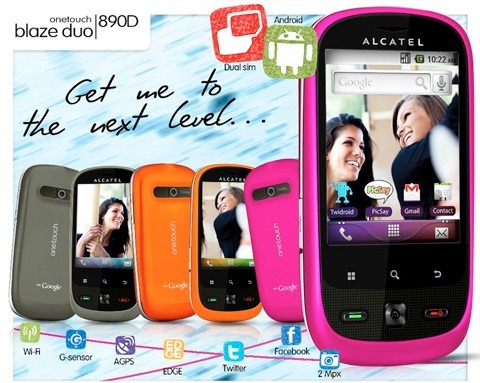 may alcatel android phone (unit 890D )was not functioning well ,, what should i do ? for better appriciatation of this phone. Hi Krishalie, it might be best if you brought it to Alcatel customer service and have it looked at if you’re having problems. Do please keep us posted on the progress! what about messaging storage,is it unlimited,same for contacts,or just like samsung it should be all stored at phone memory ?? Most android phones have a pretty big storage for messages and contacts so there shouldn’t be much of a problem. It would take tens of thousands of messages to fill a minor part of the memory provided. Same with the contacts. It shouldn’t be much of a problem. Hope that helps! Hi, cud u tell me how to connect to FTP and where n how can i get VRS software for my Alcatal OT 890D. this is the best phones i hav ever used till date. thank you panzerpuff for ur prompt help. cud u help me by telling whether i can download Voice Recognising Software for my medical transcription on my PC for free and from where. my alcatel OT 890D is Android but not 3G, how can i make it faster for internet as i need internet most of the times due to my work profile. There’s a lot of voice recognition software for PC but not a lot are free and great. Windows has their own dictation software built-in so try that. Unfortunately, you can’t really improve the internet speeds on your phone because you’re limited to only 2G. There’s not much you can do about that. Hope you could help me. When I did a factory reset on this phone I eventually got stuck in the “touch the android to begin” screen. Nothing happens even if i click on the android. Is there a stock rom for this particular kind of phone? Hmm that’s weird. Even waiting doesn’t work? Try doing the recovery mode boot. It’s usually a combination of a volume button + power button when turning the phone on. If that doesn’t do anything, maybe you have to call customer service.